Friends of Katy High School’s mission is to reinforce the academic initiative at Katy High School by providing the tools and support necessary to enhance maximum educational opportunity and to improve the overall academic performance of all students. Membership in Friends of Katy is open to all families and school staff. Money generated throughout the year is used to support student scholarships (at least 10 per year) and support faculty needs. We are currently seeking individuals to join next year’s Board to help us achieve these goals. 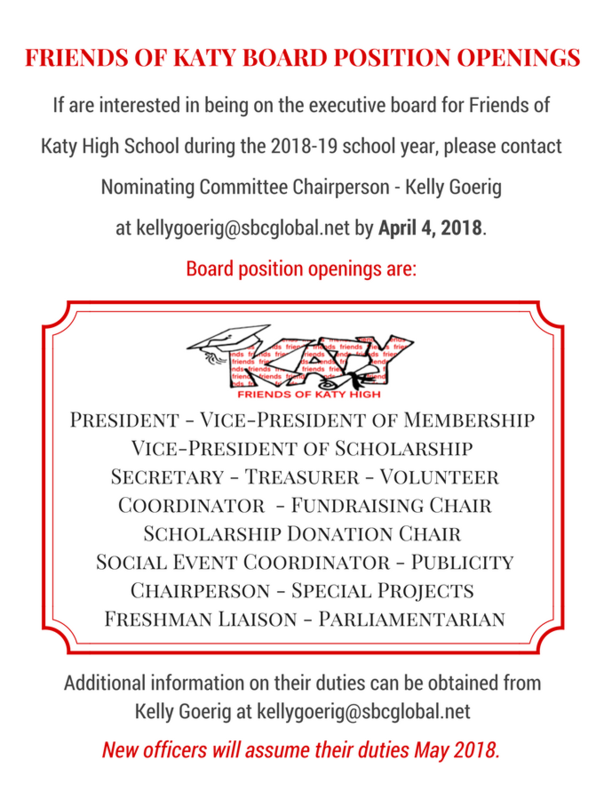 If are interested in being on the executive board for Friends of Katy High School during the 2018-19 school year, please contact Kelly Goerig at kellygoerig@sbcglobal.net by April 4, 2018. Share this flyer to help us spread the word! For information about our organization, learn more here.